Let's Learn English Lesson 3: I'm Here! Anna ຍ້າຍເຂົ້າໄປຢູ່ຫ້ອງແຖວໃໝ່ຂອງນາງແລ້ວ. ນາງຢາກເຮັດອາຫານແລງກິນ. ນາງລອງໂທໄປຫາ Marsha ເພື່ອຂໍຄວາມຊ່ອຍເຫລືອ. Speaking Practice Lesson 3: I'm Here! 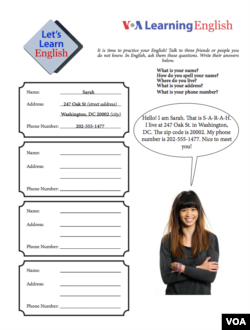 Download the worksheet and practice speaking English by asking and answering questions about addresses. Click to download the Activity Sheet and practice writing the names and addresses of friends or classmates. The strategy for this lesson is Look for Ways to Practice. Good language learners are always looking for new and different ways to practice using the language they want to learn. Here is an example of a learner who uses this strategy. Alex wants to be more confident when he speaks English. He downloads podcasts of conversations in English. When he is walking or riding in a car he listens and repeats each sentence he hears. He writes text messages and emails in English, using the new words he wants to learn. Every day he talks with anyone who will speak English with him. Sometimes people ask him, "Did you live in an English speaking country?" because he is so confident in using English. Alex laughs and says "Someday!" and looks for more ways to practice. For more information on using this strategy, see the Lesson Plan. How about you? How do you find ways to practice speaking English? Write us an email or leave a comment in the Comments section. Desktop Computer: Click here to go to the listening quiz. Click on the button below if you are on a mobile device or our mobile site. Each question has a video. Play the video and choose the correct answer. Listening Quiz - Lesson 3: I'm Here! 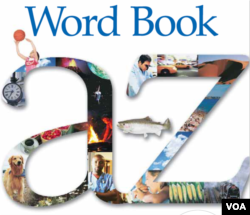 See the Lesson Plan for this lesson for ideas and resources. Send us an email if you have comments or questions.